Three decades ago, few patients with acute myeloblastic leukemia (AML) achieved remission, and almost none were cured . Now, with the application of modern intensive combination chemotherapy, more than 80% of children and young adults reach this first hurdle [2,3]. Although the majority are destined to relapse, if treated with this modality alone , this risk can be reduced to less than 20% by the use of allogeneic bone marrow transplantation (BMT) following myeloablative/immunosuppressive chemoradiotherapy . Preclinical studies predicted an immunotherapeutic benefit of BMT [6,7] (vide infra), but prior to our understanding of the HLA system and the use of BMT, the first clinical attempts to apply immunological measures in the treatment of leukemia involved studies with Bacille Calmette Guerin vaccination done by Mathe . Subsequent randomized studies demonstrated no effect on length of remission but did show prolongation of postrelapse survival-the first evidence of benefit from planned immunotherapy (as opposed to spontaneous cures seen in the occasional patient). These studies indicated limited benefit, but they did herald the modern era of immunotherapy in which recombinant technology has made relevant cytokines available in therapeutic quantities. 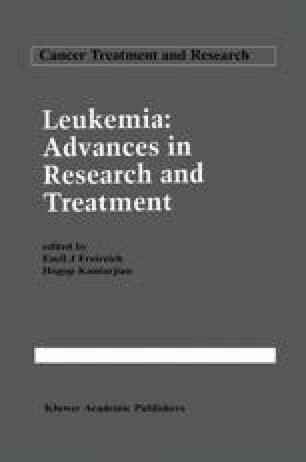 We reason that the antileukemic immunological benefits of allogeneic BMT identified in man as the graft versus leukemia (GvL) phenomenon  can be induced by Interleukin 2  without the requirement for a donor and that its use in the setting of minimal residual disease (MRD) in AML deserves further investigation.